What is "The Secrets of the Big Dogs?" Who is a Big Dog? I bought "The Secrets of the Big Dogs" internet marketing ebook wanting to look behind all the cheesy ads and see if it contained all the best internet marketing secrets. After all, I have been marketing online for 20+ years. And during that time have spent money buying the next best thing. This ebook cost seven dollars. It is not like spending $2,000 on a worthless marketing course. Fortunately, I never had the guts to spend that kind of money on training. Seven dollars I can handle. So how do I gain from spending seven dollars? More importantly, how do you benefit by buying a copy of "The Secrets of the Big Dogs." Website traffic - generate up to 5 million quality, targeted prospects every month. Cashflow - realistically earn residual income from over 12 streams of income. Time - complete my day-to-day tasks of running my business in just 30 minutes a day! So, how will "The Secrets of the Big Dogs" (SBD, for short) solve these problems? 1. Tell you the 11 secrets so that you may implement them. It is an internet marketing digital product written by Stan Stuchinski. In 200+ pages, Stan walks the reader through internet marketing step-by-step. First written in 2001, it has been updated annually to reflect changes in internet marketing. The ebook designation is inaccurate. It is an online book in the form of a collection of webpages. There is not a downloadable version of the book unless you want to copy the webpages. One thing it is not. BDS is not a get-rich-quick scheme. Stan tells his readers the brutal truth about internet marketing. He emphasizes the importance of being patient and persistence in achieving success online. But many people do not want to hear this. They go online looking to get-rich-quick. So the scammers and hypsters will tell people what they want to hear. Well, if you can't get-rich-quick, then what is the next best thing? The next best thing is discovering the secrets of the big dogs who have been successful at internet marketing. One of the 3% who actually are successful and makes money online. Yes, it is true. 97% of the people who try to make money online don't. If you are among the 97%, then read on. I am not going to rehash 200+ pages of information with this review. There are eleven secrets exposed in Chapter 3. The secrets are proven business and success principles applied in the internet environment. You could sit down with a pen and piece of paper and think up 11 principles for online business success. Hint: Signing up for an online program that offers you substantial return overnight without doing any work is NOT one of the principles. Secret #11: There are no secrets! Well, that is not entirely true. Top marketers and gurus do not tell their readers or students everything they do to be successful. They hold some things back because they want to remain on top. But if you work this business long enough, you can figure it out. In Chapter 4, Stan discusses the online traffic generation/advertising methods below. These are consistent with what the experts tell us. Stan's preferred method is email advertising. He dismisses the others as being not very effective. I take exception to that. Search engine marketing is effective. My first review of the SBD ranks #2 on the Google Search Engine Results Page. 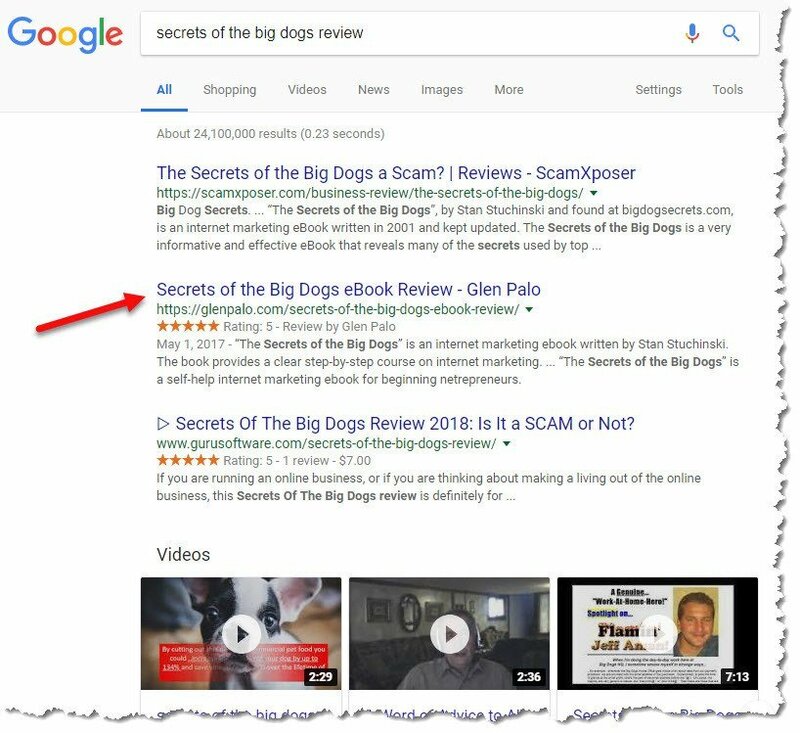 My original review of "The Secrets of the Big Dogs" shows up in position #2 in the Google SERP. I understand why he would dismiss Search Engine Marketing. Not everyone can be on the first page of Google. Plus, if you don't know how to do SEM, then your options are to learn or hire someone to do it for you. Stan is correct about the power of email marketing. How many times have you heard, "the money is in your list"? Yet, it takes time and effort to build a list of subscribers. C.H.I.P. is a portfolio of 16 high traffic, residual income programs. The 16 programs include 14 safelist/mailers, 1 traffic exchange, and 1 tracking tool. C.H.I.P. solves the problems of traffic, cashflow, and time. A safelist is a list of members who have agreed to receive promotional emails from other members. By viewing emails from other members, a member will earn email credits. The member uses accumulated email credits to send promotional emails to other members. A good safelist owner will maintain a clean list of subscribing members by deleting members who break the safelist rules (promoting inappropriate material) or are inactive. As I stated above, SBD will solve the website traffic problem by generating up to 5 million quality, targeted prospects every month via the traffic generation programs within the C.H.I.P. program. However, the total membership of the safelists and traffic exchange listed in C.H.I.P. does not total 5 million people. For example, the largest safelist is Herculist, which has 80,775 members. As a Gold member, I can send one promotional email to the 80,775 members every day The total emails sent for 30 days to 80,775 Herculist members is 2,423,250. Not all programs within C.H.I.P. provide membership numbers to the members. So, unless Stan has information from the program owners, the total number of prospects is anywhere near 5,000,000. It is an issue of semantics. The correct term is email recipient and not prospect. Viral Mail Profits, one of the C.H.I.P. programs, uses the term recipient per the following screenshot from my account. I blurred out information not relevant to the discussion concerning the difference between target prospects and email ad recipients. Regardless of what you call the traffic, C.H.I.P. generates a great deal of traffic to your website or offer. When compared to Search Engine Marketing (SEM), email marketing brings more traffic. This is because SEM requires high search engine ranking. SEM is a passive form of advertising as you wait for people to find your website or offer on a search engine. Many marketers cannot wait for organic traffic (visitors from search engine results pages). So they "go out and get visitors." The C.H.I.P. portfolio creates cashflow. The programs generate cashflow in two ways. 1. From the sale of products/services promoted to the other program members. For example, I promote the SBD program to Herculist members. If they buy SBD for $7, I will receive a commission from the sale. 2. From commissions generated from members who upgrade within the individual programs. The portfolio programs have different level of memberships, which are commissionable. For safelists, higher levels of memberships allow members to mail to more members more often as well as earn a higher commission. To his credit, Stan does not encourage members to spend money they do not have. Have a plan and a budget. And stick to it. As members generate cashflow, they can use the money to upgrade to higher levels or wait for sales Like Black Friday sales for example. Or do what I have done. Send an email​ to a program owner and ask for a sale price or opportunity to make a lifetime (one time) purchase. The C.H.I.P. portfolio is designed to save time. 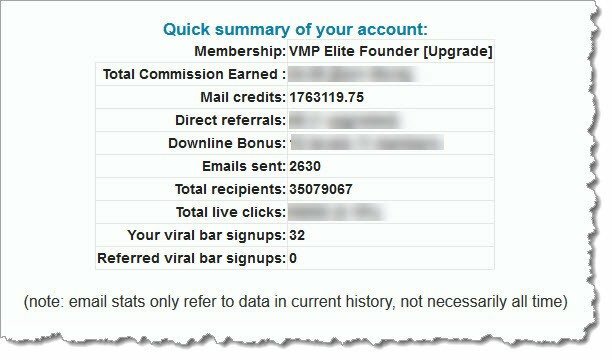 Viral Mail Profits, one of the C.H.I.P. programs, is an email management program designed to help you schedule and mail to your safelists. I use it everyday. Spending less time sending emails lets you do other things like having a life. Chapter 6 discusses the SBD affiliate program and the benefits of becoming an Alpha Dog. Being an Alpha Dog enables you to sell and earn 75% commissions on the ebook. The biggest benefit is using the book to build your downlines in some or all of the programs listed within SBD. Alpha Dogs can promote one link (for the book) instead of the individual C.H.I.P. program​ links. The book in essence promotes the individual C.H.I.P. program​s for you. Imagine sponsoring other Alpha Dogs, who in turn join the programs using your referral links. I recommend "The Secrets of the Big Dogs." It provides an honest, if sometimes brutal, overview of internet marketing, particularly in the make money online niche. If nothing else, it helps people avoid the hype of get-rich-quick schemes and scams. There are internet marketers who consider the use of safelists and traffic exchanges as ineffective. But not everyone can afford $100 or $1,000-a-day Facebook ad campaigns or Google Adwords pay-per-click advertising. Email marketing is effective for many Big Dogs and those waiting for their organic traffic visitors to start showing up. 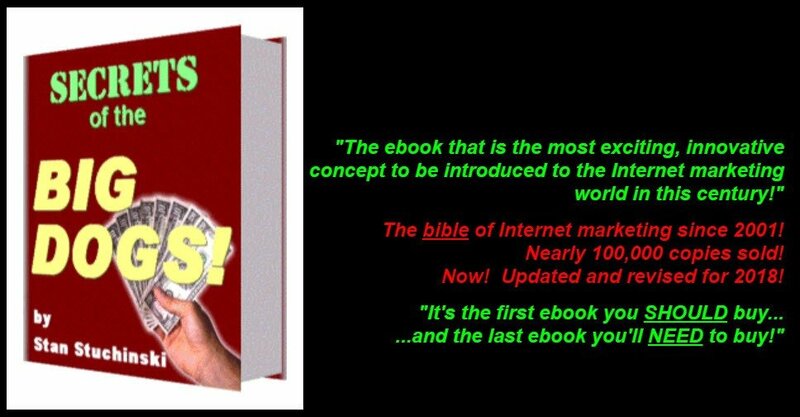 If you have any questions or comments about this Secrets of the Big Dog internet marketing ebook review, please fill in and submit the form below. I love feedback. Grab a copy of "The Secrets of the Big Dogs"